. . . was born in 1930 in Granada Hills, California, the same town as future World Champion, Phil Hill, and Ginther worked on Hill’s cars before making his race debut in 1951, and later partnered Hill in the 1953 Carrera Panamericana. Hill crashed their Ferrari but they returned in 1954 to take second, behind works driver, Umberto Maglioli. Ginther combined driving privately entered Porsche, Ferrari and Aston Martin cars with working in the garage, including trips to Maranello to help ‘sort out’ European customer cars… and eventually moved to international events like the 12 Hours of Sebring and Le Mans. 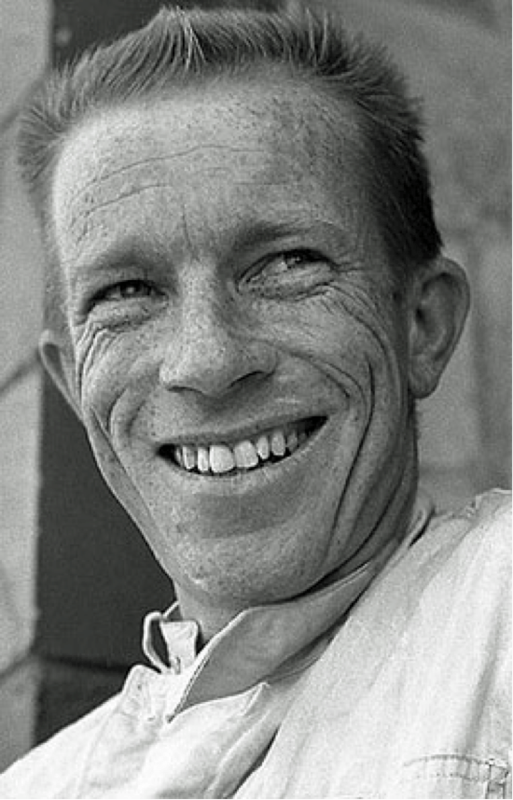 From 1954-1959 – his services were highly sought by many American importers of European sports cars. GP Ginther was a race leader, for 25 laps, before being passed by team-leader, and old friend, Phil Hill, for a 1-2 finish. This was Ferrari’s only win this year as Jack Brabham’s Cooper and Moss’ Lotus dominated the season. For two years (1959-60) Ferrari stubbornly held onto a front-engine design and, desperate for success against these little British whippersnappers, ran three or four cars, calling upon many drivers to see how they would fare, and Ginther was one of them. He drove in four races, finishing sixth in the first two (Monaco and Holland), and second in Italy. For 1961 Enzo relented and, with a regulation change to 11⁄2-litre engines, Ferrari built a powerful new V6, mounted in the rear… while the British constructors despaired, hunting round for something better than the very old Coventry-Climax, straight-4 (which even BRM were obliged to use), and trying to delay the introduction of the new regs. Ferrari entered Hill, Ginther and von Trips, with an occasional fourth entry, and five at Monza. Moss won two masterful, historic races at Monaco and Nurburgring but otherwise Ferrari were invincible, and won their first Constructors Championship. Although Moss won at Monaco Ginther was the only other driver to stay with him, finishing just 3.6 secs. behind, and posting the fastest lap of the race, on a circuit where Ferrari could not have expected to be fast. Ginther also scored the fastest lap at Spa (another drivers’ circuit), and had two further podium finishes, to place fifth in the championship. In 1962 the now 32-year-old Ginther joined Graham Hill at BRM, where he was acknowledged as a solid No.2. Indeed they finished 1-2 in Italy but, whereas Hill took his first championship, Ginther finished down in eighth after one other podium and four retirements… but… in 1963, as Jim Clark’s Lotus 25 ran away from everyone, Hill and Ginther finished second and third in the championship. Actually Ginther had more points than Hill but back then only the best six results counted, which put them equal, and Graham took second due to his two wins. Ginther finished second to Graham on both occasions, and had three more podium finishes during the year. Things remained much the same for 1964, the Hill/Clark dice being joined, and beaten (just) by John Surtees’ Ferrari. Ginther continued to play solid support to Hill, and finished equal fourth in the championship. In the middle of the season Honda made a low-key (V12) entry in the German GP, and finished thirteenth. Two later entries ended in retirement so, for 1965, Honda enticed Ginther to provide his vast experience as a test and development driver. Interestingly, virtually everyone complained of serious understeer in Mexico, much more than had occurred before. Hardly anyone knew why, or bothered to ask anyone else. But virtually everyone had a solution: boost front tyre pressures 7 lb. over the rears, when normally the cars were run with the rears just slightly higher. Ring any bells…? 1966 heralded the start of the new 3-litre formula and, once more, the British teams were casting about for engines, the all-conquering Coventry-Climax having decided to pull out. Brabham managed to get Repco to develop a V8 Oldsmobile engine, and Ferrari had the choice of V6 & V12 engines. Meanwhile Honda disappeared until the seventh race, where they arrived with a new V12. Ginther was leading this car’s first race before crashing out, and breaking his collarbone. Both cars also retired in America before scoring fourth and eighth in Mexico. Brabham ran away with both championships (still the only time a driver has won the championship in a car of his own manufacture) but for Ginther it was a wasted year. For 1967 Honda geared up for a major assault and signed John Surtees from Cooper, where he had moved in 1966 having quit Ferrari after two races because they wouldn’t let him race at Le Mans. Ginther was sidelined. He managed to get an entry with Gurney’s Eagle team at Monaco but failed to qualify and, at 37, that was it. Ginther also got an entry in one of Gurney’s cars for the Indy-500 but, when a broken fuel-line sprayed ethanol/gasoline on him, reminding him of a previous burn experience, he abruptly retired. In 1966 Ginther had appeared in, and been a technical advisor on, the film, Grand Prix, driving for the fictitious ‘Yamura’ team. In eight seasons he scored one win, fourteen podiums, three fastest laps, a third in the drivers’ championship, several memorable drives while supporting both Graham Hill and Phil Hill, and deserves to be remembered in this list of great drivers – who never won the World Championship. Richie Ginther died from a heart attack, on holiday in France, in September, 1989, aged 59. You should seriously consider a small run book with good quality photos. If you decide to do so put me at the top of the list. Crowd funding will cover cost, and I’d be happy to donate. Even an eBook might be worth considering if you want to control cost. Glad I brightened up your morning, Colin. Don’t be too modest, it’s a great article! it doesn’t matter to me if we completely agree (or not!) on the list. Its the quality of what you are doing that impresses me. There’s obviously a lot of thought gone into each article, I really like the style, and there’s always a nice little ‘I didn’t know that’ moment for me. I could see you develop a series around owners, driver managers, cars, races, technical directors etc using this style, if you wanted to. Exactly…the actually composition of the list and ordering of the drivers is secondary or even tertiary to good quality writing that’s technically proficient and engaging. If a reader is genuinely captivated, he’ll be transported to that world and momentarily transcend his comparatively mundane existence. As long as BJF can maintain his enthusiasm and energy to ensure a consistent output for the duration of the series, then yes, the end product should be pretty great and worthy of a print run (if done “right”, copy-edited, factually correct, etc)! 1) scour the comments (but don’t take any criticism personally) and incorporate any corrections like “D’s” below regarding Ginther’s preference for “Richie” w/o a “t”…this kind of accuracy is crucial to conveying both expertise of the author and authenticity of the material…and it’s available “for free” basically b/c BJF gets the benefit of review by multiple passionate fans who have their own expertise in the field!! 2) if you haven’t already try to contact the families and former associates (or their families) of the drivers and make them aware of your efforts and seek their support and endorsement. they may be able to provide something as simple as review for factual accuracy and additional detail, but also something more valuable even if they would agree to allow you to scan original photos or even photograph memorabilia. I know it’s not easy to be so fastidious and chase down leads and try to contact 20 sets of peeps, but it would be so worth it! at least try to let them all know b/c their natural enthusiasm might take care of some of the work of trying to sell ’em on your project! OH! Also, just make sure you properly establish your authorship too, so that your work doesn’t get stolen and then sold to autosport+ for example! In fact, while I don’t want to undermine the Judge in the least, consider trying to sell a few of your best columns as well, once they’ve had a run here perhaps (disregard this advice if the Judge wouldn’t be OK w/ that… I’m just brainstorming and approaching this from what would be best for the author himself). Anything you can do ethically to build interest in the series and establish your credibility as an author would help ensure the success of a hard-copy print run, crowd-sourced or not. Does this site use advertising? Idk b/c I run ABP extension in my Chrome so never see the ads, but if this series builds a following it could be a source for a bit of revenue for His Honor, too, to rent the server or pay for the domain & email or whatever. That’s it! Keep up the great work! I’m loving this series! Brilliant idea. Congratulations, BJ. All publications and record books, both at the time and still now, honoured that preference and spell him Richie Ginther. May seem a minor thing but it hit me in the eye as soon as I saw your heading. Best to correct it when you have time, my learned friend, since this is developing into a major work. Woe… Woe… and thrice, Woe…! Thanks for the comment ‘D’… Entirely my fault… especially as I am also old enough to have known better. I’ve never heard of him. But i loved reading the whole thing. Never too old to learn. Hahahhaha. Best laugh I had all day. But hey it’s not wrong to not know. It’s wrong to don’t want to know. As i said earlier. I enjoy this series of all time greats who weren’t great enough… but no matter what i believe ickx should be in the top 3. (Along side villeneuve and dan gurney) but I’m waiting impatient to see this series unfold. Another nice article, though initially not a name that immediately springs to mind, at least for me. Just to add, Ginther’s record over his 8-year F1 career statistically doesn’t initially seem fantastic, until you consider the fact in those 8 years he only actually started 52 GP’s, so in effect a 3 year career in modern terms. His one win, 13 more podiums, and a total of 28 top-6 positions out of only 52 races is much better in that context. What I like best about this is that even if I have some familiarity with a driver, I still learn new things about them while reading the articles! In this case, Ginther features in Grand Prix Legends (1967), and the 65 and 66 mods as well. Yet despite probably having read his Wikipedia page and such before, this article (and comments!) still put his achievements into a new context for me, and make me appreciate his results more than before. 1 win, lots of podiums, pretty much half the time in the points… makes him sound a lot more like Kubica for example in the modern day, who only had just about 4.5 seasons, but really made an impact in F1. Another excellent article in a fascinating series. I remember being surprised and delighted with his only win at the end of the 65 season. It’s good to stir the old memories; also brought back the mesmerising sight of the RA273 exhaust pipes – a bizarre art form in metal!! After Collins and Cevert another almost forgotten great who showed exceptional talent on occasion – e.g. Monaco 1961 and Mexico 1965. Waiting for the next with anticipation. merely 3 great drivers listed so far. I cannot wait for the entire list! so informative. so many memories! I am certain ALL of us will end up wishing for a couple of drivers to either be a part of – or excluded from your list. but so what?? this is such an amazing work in progress. thankyou for your hard work, dedication and passion!!! and MUCHO thanx to TJ13 for sponsoring content available nowhere else!! Well BJF, its all pretty positive from where I’m sitting. You deserve it all for your wonderful efforts.